At the Shirtmakers Symposium in Florence last week we had a display of five shirts, one made by each shirtmaker. The theme was ‘smart/casual’. I wanted to see what the makers considered a casual shirt that could transition from an office to a bar, or just be fit for a dress-down office. 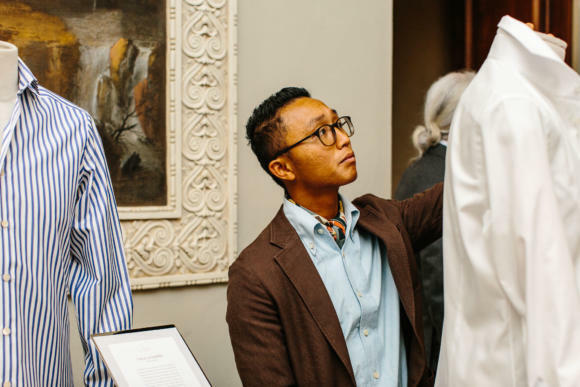 They all picked different Albini cloths to demonstrate this, and the range here was interesting - everything from denim to white oxford, from butcher’s stripe to gingham check. 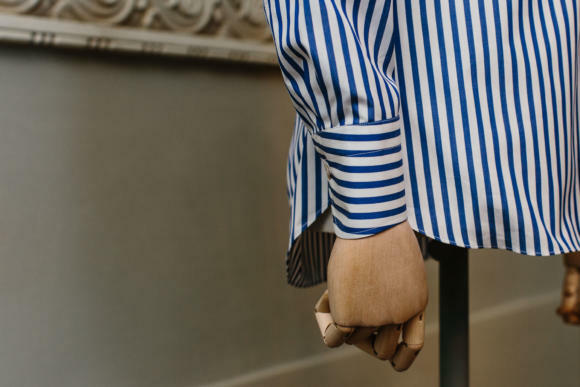 However, for most men these would still firmly count as smart shirts - something that reflects both the range of modern shirtings, and perhaps the relative inexperience of shirtmakers in making casual styles. 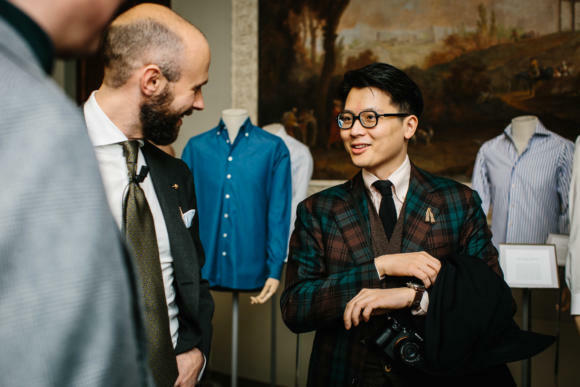 More interesting for me were the technical details, which the shirtmakers often included to demonstrate the range of what they could do. 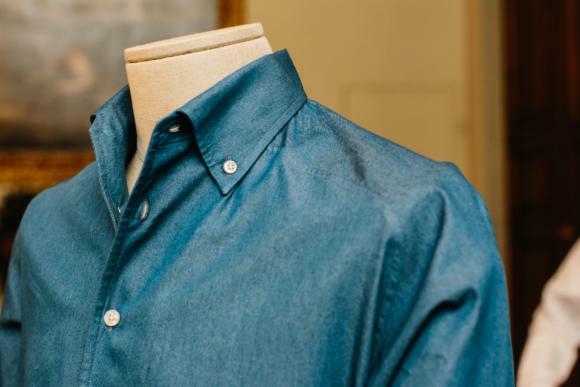 Budd Shirts in London, for example, made its denim button-down shirt with a one-piece collar and a raglan sleeve (above). Not only is Budd not known for stylistic variations like one-piece collars, but I had never seen a raglan sleeve on a shirt before. As with tailoring, a raglan sleeve is difficult to cut and make, but has a less precise fit. It’s certainly unusual, but whether you like the style is more subjective. Emanuele Maffeis had made a shirt with two unusual details. Although some do this for comfort, here Paolo Maffeis presented it as a good way to stop the tie from slipping, since the lining has greater texture than the shirt cloth. Second, the front of the shirt had a double layer, showing as a large ‘V’ down the chest. This is an old technique for shirts worn in warm weather, where a very lightweight cotton is used but doubled in the front to avoid it being too transparent. Of course, this was for an age when men would rarely take their jacket off, and the back and sides would therefore not be seen. The Ascot Chang shirt had another technique under the collar - this time exposing the lining all the way along the seam between collar and band (above). This is intended to make it easier to fold the collar down, making it snap into place and never fold up. 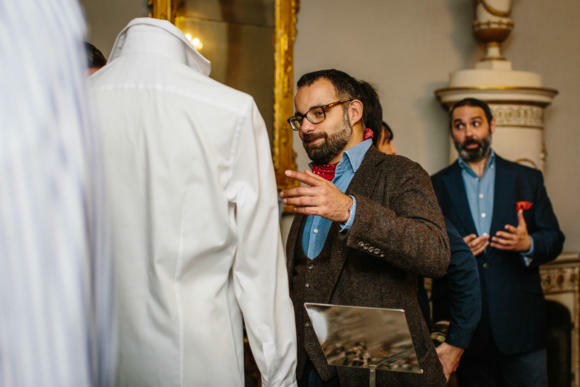 The others, Anto Shirts and Luca Avitabile, didn’t have particular technical aspects, but Luca highlighted the tightness and tapered shape of his cuffs (above). 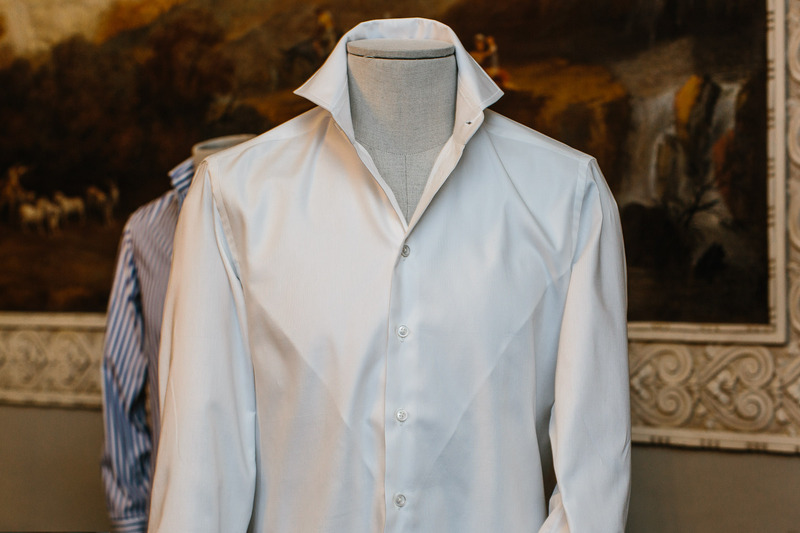 And Jack of Anto Shirts had elected to make his casual style with a white contrasting collar, but the band the same material as the shirt body (below). For Jack, having only the collar (or the ‘cape’, if you count the collar as the whole piece, including band) in white is more casual, and frames the face better. It is what he wears whenever he’s working and not wearing a tie - and a contrast collar certainly provides an alternative focus for the shirt when a tie is absent. Although I don't wear contrast collars I certainly prefer this design with the band kept in the same material as the rest. 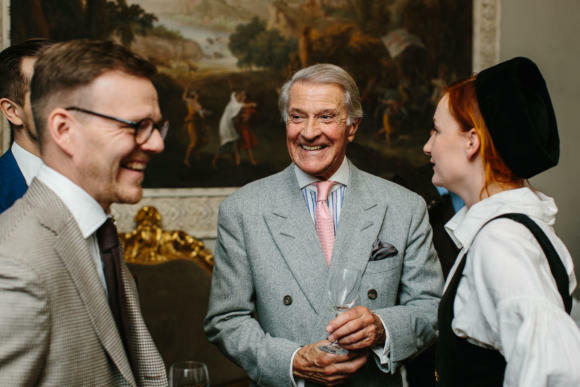 You can follow the discussion on Technical details at the Shirtmakers Symposium by entering your email address in the box below. You will then receive an email every time a new comment is added. These will also contain a link to a page where you can stop the alerts, and remove all of your related data from the site. Very interesting details. Some of them I did not know before. Thank you. BTW who is the Gentleman in the grey db suit? He is one of Steve’s biggest customers. All very nice shirts but you are right, the only one I would actually consider smart/casual here is the Budd denim shirt. It does reflect some of the issues I have had with some bespoke orders. I do think the Budd denim would look better in PS denim cloth however !! I’m obviously biased, but I agree! I go along with Adam’s reservation here and question if these shirts have hit the brief on smart/casual. The Budd example does perhaps due to the collar and material chosen. The others especially the one with contrast collar seem to be more smart shirts intended to be worn casually; a different thing in my view. 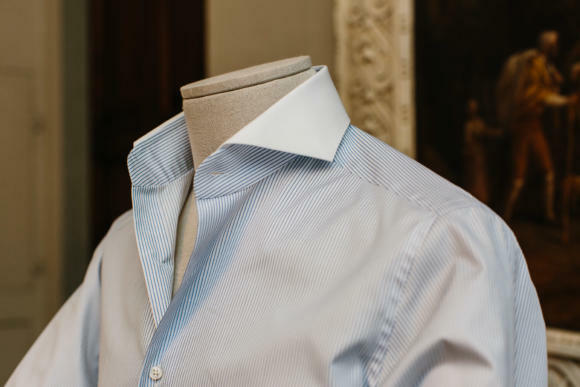 The details highlighted are interesting -one thing about the lining in the Ascot collar, Simon – would this make the collar at the fold less durable and therefore prone to wear and fraying over time? Very nice shirts indeed! Especially like the look the first gentleman is wearing. Any idea on who he is and the make? 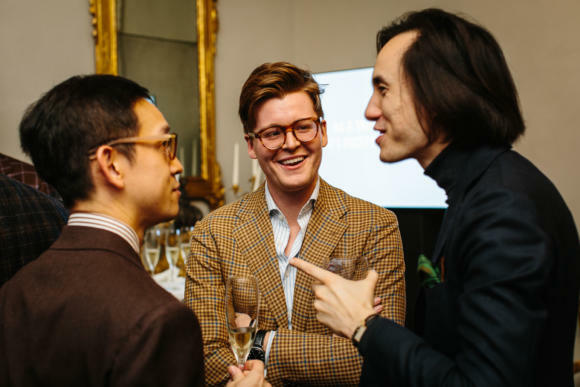 The man speaking with Simon? Nope, sorry, the man in the very first picture, wearing the Oxford shirt and scarf. My name is Yee & I’m a trouser maker based in Brisbane Australia. Unsure if this is what you’re after but I’ll be extra detailed. Scarf – silk I sourced from Lake Coma & hand rolled. Shirt – mtm chambray one piece collar from Dylan & Son(Singapore) great value for money for those that visit Spore regularly. What’s interesting is it is made with a particularly basketweave Japanese washed wool called ‘Ozone wool’ which is made without any chlorine(more eco-friendly). 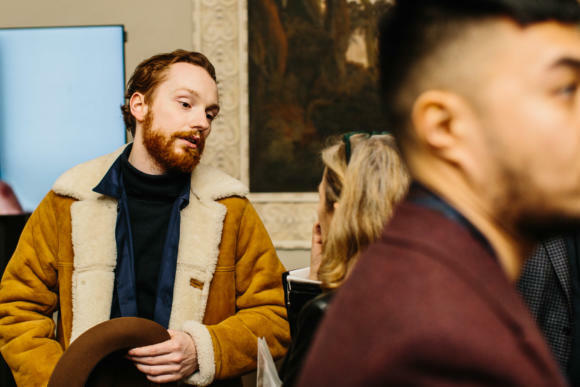 It has a natural stretch & I have never steamed the garment, it bounced straight back after less than an hour hanging, which is why I guess it’s my favourite travel jacket! Thank you so much, this is most kind. Do you happen to have an blog or Instagram account? I really like your story and would like to learn more about your style! 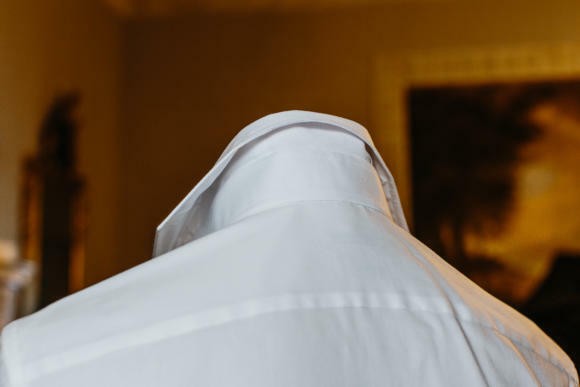 I first saw the technique on the Ascot Chang collar – the exposed lining in the underside of the collar – on Tom Ford shirts in 2008/2009. I asked a salesperson if that was functional or a flourish and he said that it allowed the collar to wrap around the back of the neck tightly and comfortably with the benefit of making it more comfortable to wear a tie, because you wouldn’t have to tie it so tightly to prevent collar gap on an imprecisely sized collar, the gap would be redirected to the front of the collar near the adams apple where it is less detectable and in certain circles more acceptable, and to redirect the weight of the collar forward when worn without a tie so it would stand up more easily to create the signature Tom Ford tie-less aesthetic. The latter assumes you also have a jacket with a collar that fits well too, but that’s a separate issue. 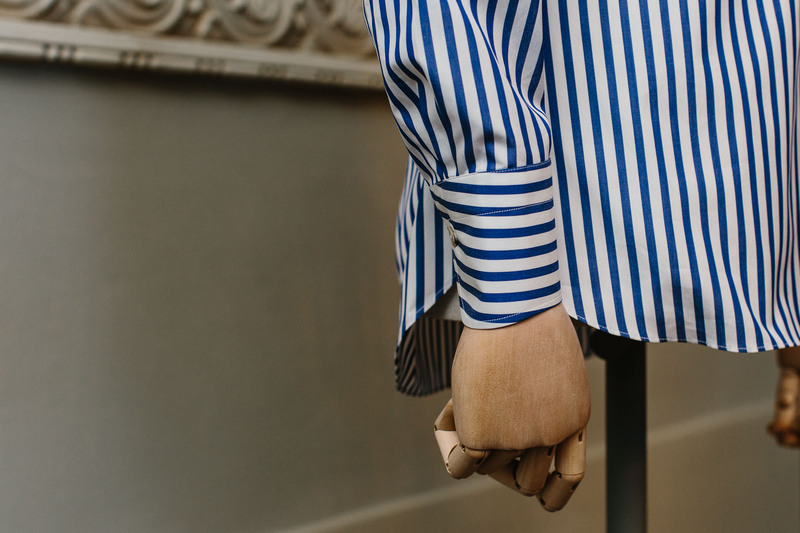 Having purchased a Tom Ford shirt with this feature I can vouch for both of those things being a true outcome of this feature and I subsequently had my shirtmaker incorporate it into the shirts he makes for me. It is wonderful. It is one of those subtleties of the make that you wouldn’t think could have the impact it does on comfort. This was the only thing in this piece I found remotely interesting in this article and great to hear that it actually works! An invisible subelty that could help with the mission to find a collar that stands up well when worn open under an A&S suit? I wouldn’t consider any of these shirts to be ‘casual’ in my understanding of the word. The Budd comes closest, however, I’m really undecided about the raglan sleeve. An interesting exercise nevertheless! Your photographer took some nice pictures of the guests! I enjoyed seeing them very much. In fact raglan-sleeved shirts could be found in Santillo. They have produced this kind of vintage design for some time. 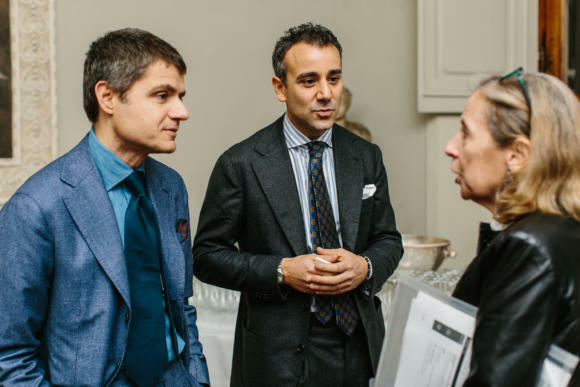 Simon, I have been using Simone Abbarchi for many years and will have a first meeting with Luca Avitabile in a few weeks on the back of the fact that you seem to like his craftsmanship so much !! What is the secret to a nice crisp, firm spread collar on a business shirt I.e one that doesn’t buckle / bend. One that looks starched without actually using starch. 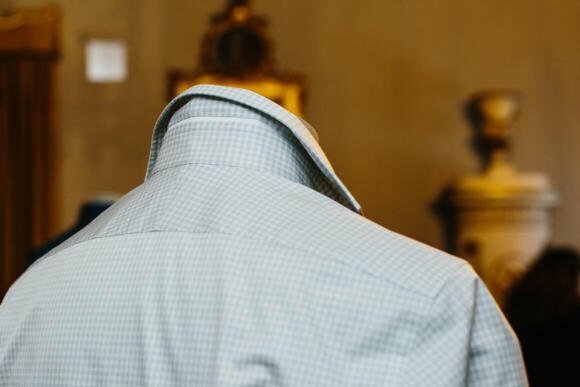 The French shirt maker Daniel Levy posts wonderful shots especially of his business shirt spread collars on Instagram. I welcome your thoughts and thanks in advance. I like the exposed lining at the back of the collar. That is quite effective for tie grip. Interesting that none of these use a French front placket. To me this can be nice to make an otherwise quite formal shirt wear a bit more casual especially when the tie is off. Also I guess I am a bit biased since this seems to be a very quentissentially American style as well. I’ll be doing my first bespoke shirt commission with Ascot Chang. Am I suppose to get a basted fitting like for a suit, or is it different for shirts? I will get measured next month and then they will straight up finish the first “trial” shirt and ship it to me, at which point I will take it with me to Hong Kong this January for a fitting taking into account any adjustments and then a final fitting before I leave and go back home. Assuming I am happy with the pattern for the trial shirt, they will then ship the remaining two shirts to me w/ the updated pattern (they require 3 minimum shirt orders, so the first is the trial shirt). Simon, in the first photo at the top of the page the chap is pictured wearing what looks like a cravat?? Any idea who I would look to for this particular style of item? Any help would be greatly appreciated.